What is an SEO Friendly URL & How Do You Configure a URL in WordPress? This post is most likely to benefit bloggers whose sites are running on a WordPress.org platform. There is a very big difference in blogging on WordPress.org and WordPress.com. I have explained the difference here. Also, I have explained the benefits of setting up a self hosted WordPress site. You will also find a guide to setting up a self-hosted WordPress site, step by step. You can find all these right here. URL configuration is one of the easiest SEO tasks but at the same time it’s a necessary step you should take to make sure that your website is SEO friendly. In this post, you will learn what an SEO friendly url is, why it’s important and how you can configure your URLs in WordPress. First off, let’s begin with some basic terminologies that will help you understand what we are talking about. A url is the acronym for Uniform Resource Locator. In simple and easy to understand words, a url specifies the web address of a page. Every web page on the internet has a unique url. The uniqueness of a url is achieved by the domain name i.e yourblog.com and the set of characters that follow i.e /seo-friendly-url/. You can see that a url is made up of two parts; the domain name which cannot be configured and the path (which I like to call the slug) to find the page within the domain name (configurable). No two pages within the same domain name can have the same url. An SEO friendly url is a url that accurately describes a page using the keywords that are easy to read for both search engines and users. Why is it so important to have an SEO friendly url? 1. A friendly URL improves the user experience. SEO is about making the user experience better and easy to understand. URLs give both humans and ‘search engine crawlers’ a good indication on what the page is all about. A user can tell by just reading this URL https://yourblog.com/seo-friendly-url/ that the destination page has information related to an SEO friendly url. The URL is also shown in the search results and well-crafted URLs are more informative and attractive to users and this means higher Click Through Rates (CTR). 2. It is an SEO ranking factor. Google has managed over the years to become better and more efficient when it comes to URL interpretation and now almost all modern CMS are able to output SEO optimized URLs, but still it’s an SEO ranking factor. Although it’s a minor SEO factor, several SEO ranking studies show that the majority of the pages in the first positions of Google have optimized URLs. In a recent study performed by Backlinko, it clearly shows that pages in the top positions of Google have shorter URL lengths. As stated by Google, some users might link to your page using the URL of the page as the anchor text, so if your URL contains relevant keywords, this provides search engines with more information about the page. How do you configure URLs in WordPress? Configuring your URLs in WordPress is very easy. 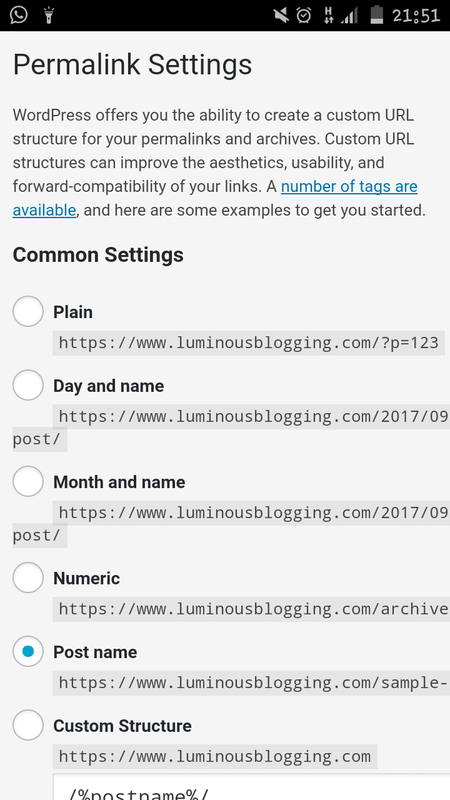 WordPress is an SEO friendly platform and all you have to do is go to SETTINGS -> PERMALINK SETTINGS and choose one of the common settings or write your custom structure. By choosing the Post name setting, your URLs will be directly linked to your domain without any folders or intermediators. When publishing a post or a page, WordPress will try and create the URL based on the title of the page. What you can do to optimize your URL is to click the EDIT button that is below the post title, configure (write a better and short slug) your URL and then click the SAVE DRAFT or UPDATE buttons. What if you NOW realize that you’ve been making SEO mistakes and you’d want to correct your URLs? No problem. If you are optimizing your URLS, it is necessary to add 301 redirects to let Google (and other search engines) know that you are changing the address of a page. 301 redirects will help you maintain your SEO rankings and improve the user experience since any URLs bookmarked by users, will still work. There are two ways to add 301 redirects in WordPress. You can make use of a plugin or write the code directly in your .htaccess file. Install and activate simple 301 redirects plugin. From the Settings menu on your dashboard, select 301 Redirects. Type the ‘old’ URL in the left side (Request column) and the new URL in the right side (Destination column). Open a new browser window and type the OLD URL in the address bar, if everything was done correctly, it should redirect to the new page. Redirect 301 /old URL (without the domain name) /new URL (including the domain name). Finish off by updating and resubmitting your XML Sitemap. In both cases (either when using a plugin or manual way), you should update your XML sitemap and resubmit it to Google. One thing to have in mind though is that if you have an already established blog with lots of published pages/blog posts, you should be careful with URL optimizations. Don’t go and change your URLs just for the sake of removing the ‘stop words’. If on the other hand, you have a URL that does not make sense or has a lot of characters that are not meaningful then it’s worth taking the risk and making your URLs SEO friendly. This entry was posted in Technology Related and tagged Blogging, SEO, url on October 1, 2017 by Patrick. it cant use if use premium/free wordpress. hmm any solution? URL with longtail keyword is the best !